Still irritable in extracting text from snapshot? VeryPDF Screen OCR can save you from these kinds of issues immediately and conveniently. 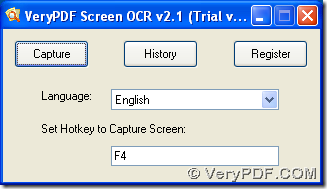 VeryPDF Screen OCR is an easy-to-use GUI tool that allows you to OCR text from screen snapshot in both 32 bits and 64 bits Windows systems. For more information about VeryPDF Screen OCR, please go to homepage of VeryPDF Screen OCR. For other software, please enter official website of VeryPDF. 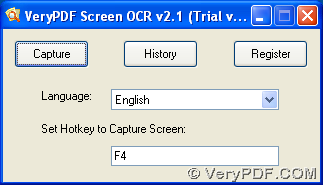 To freely trial VeryPDF Screen OCR with the following description later, please click at here. Want to know how to use VeryPDF Screen OCR to OCR text with OCR technology right now? Then, please do not hesitate to read the followings! Then, you can select suitable language of OCR technology in order to be suitable for character languages of screen snapshot. Also you can set hotkey for quicker capture later. on snapshot, you need to click one position with left button of mouse > move your mouse onto another position with press on left button of mouse, then you can see a rectangle is formed, however, if you think this rectangle can not cover all of what you want to OCR later, you need to keep moving mouse onto another position till the content in dimension suits for your demand. And then you can loose the left button of mouse, so right now, the rectangle is stationary, along with 4 buttons appears, where you need to click OCR in order to make program OCR text in selected screen snapshot of rectangle. 3. One click on OCR button brings you brand new panels, where you can notice that OCR technology has extracted characters from selected screen snapshot to text preview panel accurately. Thus, to save these characters, please click directly to save them in default folder or another place in your computer, or click File > select save text as > choose one folder in pop dialog box > click save. After you successfully save extracted text of selected snapshot in your computer, it is easy and simple for you to continue to edit this text file. Is it very convenient to use VeryPDF Screen OCR to OCR text from snapshot with OCR technology? Yes, of course, it just need several clicks like what I mentioned in this article. For more doubts on VeryPDF Screen OCR and this article, please feel free to leave your comments here or let our support team know immediately, who will give you a quick and accurate response at once. How to use PDF Table Extractor OCR software to extract table from color PDF file and save to Excel (XLS, CSV) document? This entry was posted in Screen OCR and tagged OCR technology, ocr text. Bookmark the permalink.